何 謂 也 ？ What does it mean? 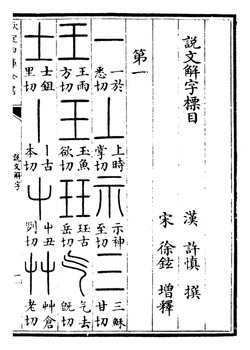 So what most ancient Chinese analytical dictionary Shuowen Jiezi explains about number three? 三 means three, it is a unification of the earth and heaven in man. Forty eight difficulty of Nanjing explains that first excess and deficiency starts in the pulse or heaven. From prehistoric times Chinese towns were built inside and outside of fortified town. Walls were built together with houses. Each wall had drum tower, similarly like European fortresses had bell towers. Following development is explained by number two. Deficiency and excess developed in the same disease. Number of the earth, enemy is already on the grounds of town but still outside of the fortified walls. From this point disease is eminent, this excess and deficiency are already a developed illness. There are not complaints, but functions of organs and the body are affected. Town is under the sedge. Three is development of disease in symptoms of patient, complaints and symptomatic picture are presented, people can see their enemies by themselves, enemy is entering into the fortress. Archaic acupuncture uses pulse diagnosis for treatment and for prevention of diseases. As it was explained in earlier article patient is induced into condition of early heaven, when his or he pulse is absolutely balanced and is in resonance with celestial qi breath. It is a condition of absolute order, when there is no place for disorder. Organism is recovering. This condition makes visible most insignificant changes of pulse to alarm practitioner familiar with archaic acupuncture to start preventive treatment before disease starts. It is a fact, that classics were written and rewritten again with additions of modern time. We can see that Nanjing has more ancient and more modern chapters, some chapters were rewritten and changed. Chapter forty eight is one of them. Ancient meaning for 虛 實 empty and full was also false and true. It means that true disease is full, this fullness produces deficiency, deficiency is the result of excess. Chinese ancestors settled in the area of Yellow River where floods were everyday reality. Great Yu saved Chine from floods which lasted for generations without stop, producing incredible lack of any food for the nation. Yu managed to built canals to move excess of waters. Fighting with excess he achieved eliminate great deficiency. First difficult issue already mention basics of triple dimension in which disease or excess and deficiencies were measure. First of all there are two parts of same Qi breath named as 榮 Rong and 衛 Wei. Increase in Rong produces deficiency in Wei, Excess of Wei creates deficiency of Rong. Thanks to the first ten difficult issues we can see exact movement, excess and deficiency of wei and rong trough the pulse. Second dimension is 陰 yin and 陽 yang. Pulse indicates that yang excess of one meridian produces yin deficiency of same meridian and vice versa Yin excess of one meridian produces yang deficiency. This reaction is similar to Rong and Wei reaction. First ten difficulties of Nanjing explain how to find yin and yang excess through the pulse. Third dimension is division in Zhang and Fu organs. Excess of meridian of Zhang organ produces immediate excess in meridian of pared Fu organ and vice versa the excess of meridian of Fu organ produces excess of meridian of Zhang organ. It happens because excess of meridian of Zhang organ (yin meridian) will make pared meridian of Fu organ (yang) even more yang relatively to its pared Zhang meridian. First ten difficulties of Nanjing again shows exact pulse indications of this event. Above mentioned explains archaic understanding of acupuncture in bronze age time when acupuncture has got it's greatest development. 1 Each meridian may have Rong excess which leads to Wei deficiency or Wei excess which leads to Rong deficiency. 2 Each meridian may have Yang excess which leads to yin deficiency or yin excess which leads to yang deficiency. 3 Each meridian of Zhang organ (yin meridian) may have yin excess which leads to yang excess of its pared meridian of fu organ and vice versa. Here we can see exact explanation of triple excesses and triple deficiencies, where excessive is true and deficiency is false disease. Excess of yang in meridian of fu organ produces excess of rong of this meridian and excess of yin in it's pared zhang meridian. It also produces deficiency of yin in same meridian, deficiency of way of this meridian and leads to deficiency of yang in it's pared zhang meridian. Archaic acupuncture uses simple pulse diagnosis to find above mentioned interactions between meridians in each particular moment of the day to treat these excesses and deficiencies directing to the place celestial yin or celestial yang produced by rotation of the earth and reflected in pulse.